For the second time in three weeks, a new record for the largest contract in baseball history has been set. The Los Angeles Angels and superstar Mike Trout are reportedly finalizing a massive 12-year, $430 million extension that will presumably keep him in Anaheim the rest of his career. It is 10 years and $363.5 million on top of the two years remaining on his current contract. Four of the six have been signed within the last month or so. Free agency is still a mess overall -- a league average innings guy like Gio Gonzalez shouldn't have to settle for a minor league contract -- but the very best players are getting theirs and moving the top end of the market forward. That's a good thing. A contract of this magnitude has a lot of ramifications and impacts a lot of people around baseball. Let's break down the winners and losers from Trout's new contract, shall we? Mike Trout: When you sign a $430 million contract, you are automatically a winner. Trout gets to stay with the only team he's ever known and that is pretty cool, and also pretty rare historically. He has a chance to go down as the greatest player ever to spend his entire career with one team. Harper held the record for largest contract for roughly three weeks. Trout's record figures to stand quite a bit longer. The Angels: Trout is already a surefire Hall of Famer and the face of the franchise, and now they know he will likely retire in their uniform. He was two years away from free agency and the "will he leave?" question was going to loom over them every day until then, which also created a "will they trade him?" question. Now they don't have to worry about it. They know Trout is locked up and they can build around him going forward. Could you imagine what would've happened to the Angels franchise had Trout left as a free agent in two years? Oy vey. Also, I'd argue the Trout's deal is a bargain. He is only 27 and has several peak years remaining, and will provide enormous off-the-field marketing value. Getting him at $35 million or so per year is a steal. The Angels keep Trout at a bargain rate, and because his contract includes no opt-out clauses, he can help lure other free agents to Anaheim and sell them on the idea that he's not going anywhere, and have it be believable. That's huge. Angels fans: Congrats, Angels fans, you get to watch one of the best players in baseball history spend his entire career playing for your team. If that doesn't excite you, nothing will. Mookie Betts: With Trout off the market, Betts is now the clear-cut No. 1 free agent set to hit the market in two seasons. The reigning AL MVP and Red Sox superstar may very well sign a massive contract extension of his own before then (he's set to be a free agent after the 2020 season), and the Trout contract does set a road map to a deal. Trout money is probably ambitious -- Betts has had one Trout-like season whereas Trout has had seven Trout-like seasons -- but hey, it gives Mookie and his agent a starting point for contract talks. Point is, Betts now stands alone as the next superstar free agent, which gives him incredible leverage. Bryce Harper: Harper did not wait long to start trying to lure Trout to the Phillies. He mentioned "a guy in about two years who comes off the books" during his introductory press conference, then not-so-subtly declared his intentions to recruit Trout to Philadelphia during a recent radio interview. The Angels even contacted MLB about Harper's blatant tampering. They don't have to worry about that now. They have Trout the rest of his career. 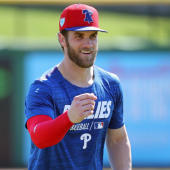 As for Harper, his contract record stood only three weeks before being shattered, and it didn't take long for his tampering efforts to fall short and look kind of silly. That's a double whammy right there. Phillies fans: The Phillies had themselves a great offseason. They landed a marquee superstar in Harper, signed quality veteran free agents in Andrew McCutchen and David Robertson, and landed big upgrades with the Jean Segura and J.T. Realmuto trades. That said, it didn't take long for the Phillies faithful to look ahead to Trout's free agency, and the possibility of pairing Trout with Harper. Trout is from South Jersey and is a regular at Philadelphia Eagles games in the offseason. The hometown connection was obvious. Instead, Trout will stay in Southern California. That qualifies as a bummer for Phillies fans. Every other team that had eyes on Trout: The Phillies surely were not the only team hoping to make a run at Trout as a free agent in two years. The Dodgers, Yankees, and Astros immediately jumped out as three potential suitors. The Red Sox and Nationals couldn't be ruled out, and maybe the Mets and Braves will be ready to spend big in two years. Maybe the Tigers too. You can't plan around a player still two years away from free agency, but it's only natural to look ahead, and imagine where your roster will be and how that player fits. All those teams can forget about it now. Trout is off the market. The rest of the AL West: Sorry Astros, Athletics, Mariners, and Rangers. You're not getting rid of Trout that easily. Only a dozen more years of him terrorizing AL West rivals.